Today brings another fun post in my Christmas series, A Season of Serenity (Now). I hope you've found the creative tips and tricks shared so far helpful! 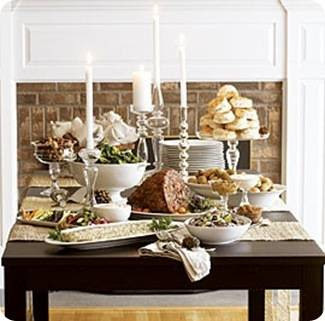 Today, one of my favorite bloggers is going to talk about ways to take the stress out of Holiday Party Planning. Kate from Centsational Girl has some excellent planning strategies, so be sure to take notes! Years ago, when the mister and I were first married, we both agreed that the one thing we wanted to do together every holiday season was to throw a party the weekend before Christmas. Eleven years ago, we started this tradition and it continues every year. We're all so busy during the year, and months can pass by so crazy fast when we don't see our friends. This is just one way we choose to show others how much we care ~ we open our doors the Saturday before Christmas and invite them all in! You know that scene at the end of It's a Wonderful Life when George Bailey looks around at all his friends and family and Harry toasts, "To my big brother George, the richest man in town!' It chokes me up every single time! 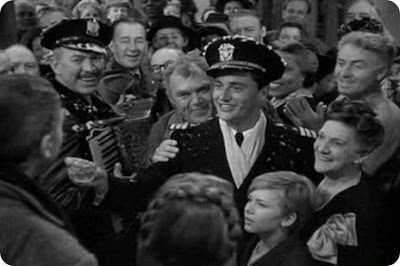 The moment in the film is about the importance of friends and a purpose filled life, but here's what I always get from this classic: it doesn't matter how elaborate or modest your home or your lifestyle, the best moments of the holiday season come from the togetherness and good spirits felt from surrounding ourselves with the ones we love. It has nothing to do with money. To me, a holiday party is a great opportunity to capture that feeling. So many people hesitate to throw a party because they're worried it will cost too much or their home isn't presentable. Nonsense! Every year, our party has grown bigger (we're talkin' 80+) but we don't spend a fortune. I enlist my friends to help! Do I hire a caterer? Nope. A bartender? Never. But a babysitter? You betcha. I was inspired to write about our holiday party after I read 101 Party Do's & Don'ts in the latest issue of House Beautiful. A worthy read, more tailored to the dinner party, but here's a few more things I've learned over the years about how to make a crowd feel welcome without spending a fortune. 1) Decorate early! The weekend after Thanksgiving is decorating weekend! If you plan to do Black Friday shopping, then I recommend decorating even before Thanksgiving like the retail stores do. I know that sounds like you're cheating on T-day, but if you're throwing a party, get those baubles up early! 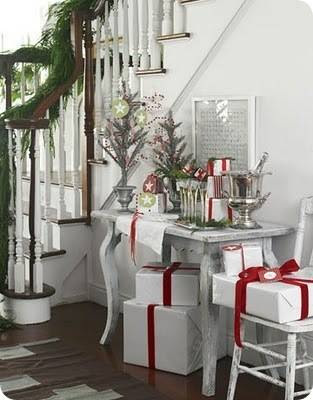 Concentrate your holiday decor where people will enter and congregate: the front porch, the entry, your kitchen, family room, dining room, and the powder room. Your decor need not be elaborate. Some candles and greenery are all it takes, perhaps some ornaments and twinkle lights strung here and there, just enough to capture the holiday mood. It doesn't take much! 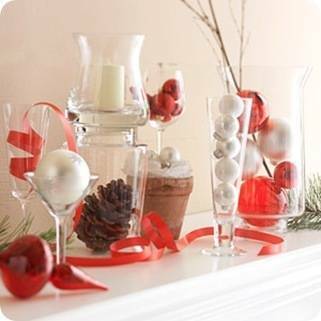 Melissa has some great tips today for easy ways to add a touch of Christmas to every room. Resist the temptation to wait to decorate the week or day before your party, we're talking about reducing stress, so decorating early is key! 2. Coats and Purses. The first thing guests do when they arrive is look for a place to store their coat and bag, so you must have a place for their coats and purses. Set aside a bedroom or a closet away from the party, or invest in a folding coat rack. 3. Have an icebreaker. Many people love to help at parties so give them a small job if they ask, or play a simple party game. One year, we wrote out names of movie characters on labels and placed it on everyone's back when they came in. They had to ask other party guests for clues until they figured out who they were, and it got everyone talking and laughing right away. 4. Create ambiance with lighting and music. Great lighting is key to setting the perfect mood at a party, so I'm a big believer in having all your main living area switches on dimmers. It's easy to do. Then light a few candles, and turn on the outdoor lights too. 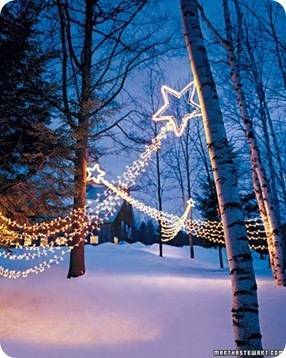 String some twinkle lights too, they add the perfect amount of light to your outdoor areas surrounding your home. Also, have a playlist of holiday tunes ready to go that lasts several hours. Pandora radio is great, also your TV cable station often has holiday playlists. You can make your own CDs or use your iPod, just have lots of merry tunes! 5. Distance your food. For a larger party, serve finger foods or one bite appetizers, nothing guests need to slice. Keep beverages in one place, food in another, and if you have room, desserts in a third location. It forces guests to circulate! I like to keep bowls of pistachios, salty mixes, or chocolate candies scattered around the house in pretty bowls too. 6. Keep some food warm. On a winter evening, I believe it's a good idea to serve some of your food warm, but to also stay away from your oven during a party. Nothing's worse than the hostess being tethered to her oven while her guests are in her home (makeup melting from a hot oven, no thanks!). The way to pull it off? Rent, borrow, or buy a chaffing dish (or two), or a warming platter. I learned the hard way to not serve those popovers, hors d'oeuvres or phyllo dough appetizers that require you to stand next to the oven for 8 minutes to judge their perfect brownness. No no no! I cook my no fail crowd pleasin' Stroganoff meatballs and penne alfredo before the party, then set them out in chaffing dishes with a nice warmed ham with rolls, and it's always enough for a crowd. Then I never need to set foot in the kitchen except to grab more ice! Oh, and always make more food than you think you need. Better to have leftovers than hungry guests! One way to keep costs (and stress) down is to enlist friends to help! I always ask a few gals to contribute some appetizers or desserts. People love to bring chocolate candies, cookies, and other signature holiday recipes or small bites to share. 7. Keep drinks simple. We serve some wine (including ours), some beer, but mostly local champagnes. People are always drawn to the bubbles on festive occasions we find. Rarely do guest ask for mixed drinks, so we stopped serving them. Always keep non alcoholic sparkling juices available too, plus juice boxes and water for the kids. .
8. Real or plastic? Plenty of entertainers say "never serve your guests on plastic plates". Ahem. I don't have an extra 80 plates lying around so guess what? You come to my par-tay, you may dine on melamine or plastic plates. Sorry, but none of my friends seem to notice or care about that. But if if bothers you, simply rent or borrow 'real' plates. But while you are free to serve appetizers on plastic or melamine dishes in my opinion, I say never serve wine or champagne in anything but stemmed glassware. Wine and champagne glasses are cheap (hello Goodwill) or can easily be rented, so at least keep the glassware elegant. Borrow them if you have to, I always do! People keep their glasses for hours (use tags or charms to help identify them) but not their plates, so decent stemware is most important. Since we had kids, it's hard to keep them occupied while we prepare for a crowd, so we invest in a few hours paid to a trusted babysitter to keep the little ones entertained and happy. If you have a super helpful grandma, aunt, or attentive friends, that works too. Anyone that can assist with the kids, especially before the party starts, certainly helps! 10. Stay stocked. Ice. Toilet paper. Firewood. Plates, napkins, utensils. Have plenty of 'em. 11. Keep a notebook. Some things work, some things don't so keep notes! The day after the party, write down who attended, what recipes were a hit, and how the party could have flowed better. Next time, you'll thank yourself! On a final note, I'd like to say that you should never be afraid to open up your home to your friends during the holidays because you think it isn't fancy enough or whatever. Your home is perfect because it is a reflection of you. Guests remember two things from a party: the flavors and the feeling. Not fancy decorations or pretentious displays. 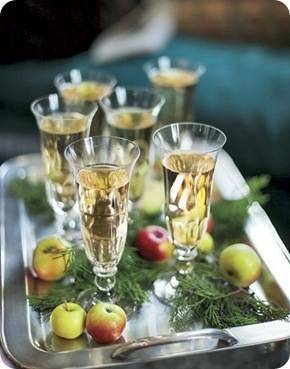 Give them some good flavor in the form of food, spirits, and pleasant scents, send them away with a feeling of good cheer, and your party is a success! What's your best tip for making guests feel welcome this time of year? Big thanks to Kate for the entertaining encouragement and advice. Throwing a party in December can be daunting for many of us! I'm still recovering from my oldest's birthday party and also the Ugly Christmas Sweater Party I helped throw the night before. One of these days we'll work up to hosting a family-style party too. If you've never visited Centsational Girl, you must stop by today! Kate's sophisticated style, good sense of humor, and creativity will have you clicking over every day to see what she has going on. So many great tips! I love that she says it's okay to use plastic plates...I could only have about 10 people over if we had to use real plates:) And #10 is a great tip too! Can you imagine running out of tp when you had a house full of guests! Great post Amanda & Kate! I'm hosting a party this weekend and will apply these tips to help me stay sane!! Thanks so much Amanda for having me today, I'm loving this series about less anxiety and more fun! Great ideas! I especially giggled on the oven tip - the hot flashes melt the makeup just fine these days. Ha! Great series! Great tips, and perfect timing. We will be hosting a graduation party for our daughter a week from tomorrow! Kate really is amazing. I remember this post from last year--such wonderful advice, so I'm really glad to read it again! I need to take notes! Thank you, Amanda, for putting together this great series. I know you've worked hard on it--it shows! And I'm loving it.